LAWRENCE – A University of Kansas professor spent 10 months in China studying the influence Western-style dancing has on contemporary Chinese society. 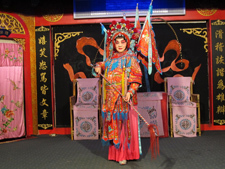 Ketty Wong, an associate professor of ethnomusicology, received a Fulbright Award to conduct research on the reasons why various generations of Chinese embrace Western dances and have made them a part of their everyday lives. Wong said it is an important question for a country that closed its doors to the West and is now undergoing enormous political, economic and social transformations. From the northwest city of Urumqi to the southeast city of Shenzhen, Wong traveled throughout the country giving lectures, collecting data, attending dance competitions and learning about traditional Chinese dance. In particular, Wong studied the growing trend of salsa and ballroom dancing. In October, Wong will discuss her research at the Moscow Conservatory. When interviewing people in China, Wong said many told her that in their culture they didn’t dance socially or they didn’t know how to dance. The concept is a very different one than what Wong grew up with in Ecuador, where almost everyone dances at weddings, birthday parties and anniversaries. “In general, many young Chinese I interviewed think if you don’t know how to dance, then you don’t dance,” she said. And yet in almost every city Wong visited, she would find retirees dancing in the parks every day. Groups of 20-100 people would bring a portable stereo and dance, often next to another group dancing in a different style. Ballroom dancing in China dates back to the 1930s — to the early years of the Chinese Communist Revolution. Today, it is the older, often retired Chinese who practice ballroom dancing. For many it is a way to socialize and stay healthy. The dancing is informal, with groups meeting daily and dancing everything from the rumba to the waltz. Wong also found Chinese who do professional ballroom dancing, taking classes from instructors and competing. Students can even earn degrees in ballroom dancing. For these dancers, the ultimate goal is to compete in England’s Blackpool Dance Festival, one of the most prestigious ballroom dance competitions in the world. While informal ballroom dancing attracts China’s older generations, salsa dancing is a popular pastime for young business professionals in their 30s and 40s. Originating in the 1970s in New York City as a way for Cuban and Puerto Rican immigrants to address social problems, salsa eventually took on more romantic themes. In the 1990s, dance instructors codified dance steps and created systems for teaching the dance, which increased its popularity around the world. Gaining interest in the early 2000s, salsa came relatively late to China and was introduced by diplomats from Latin American countries. Today, young professionals tend to be the demographic that attend salsa classes and go to salsa clubs. This generation of Chinese was born or came of age after the country’s economic reforms, so Wong said they don’t identify with traditional Chinese folk songs or the Peking opera. On the other hand, they are too old for the rap and hip-hop music popular in younger generations. “They identify with salsa because they feel it depicts them as cosmopolitan and modern; most importantly, they love the music,” Wong said of why that particular generation is drawn to salsa. Despite the age difference, Wong said ballroom and salsa dancers do have something in common. “Chinese people, whether they are retired citizens dancing in the parks or they are young adults dancing salsa in the clubs, it is amazing how devoted and disciplined they are to the practice. If they want to do it, they strive to do it well,” Wong said.